Re-setting the Central Nervous system! 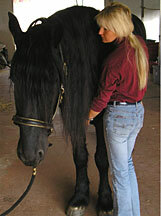 Equine Cranio-Sacral Therapy is adding a powerful perspective to the well being and the preservation of the Equine athlete. Cranio Sacral Therapy was developed after eight years of extensive studies by osteopathic physician John E. Upledger and has become a widely researched and acknowledged part of human healing modalities. Cranio Sacral Therapy is a gentle, safe, hands on manipulation of the central nervous system. It is in its depth somewhat comparable or exceeding the positive effects of Accupuncture It is however implemented through the body’s cranio-sacral system MN not the Meridian system. The objective is the activation of the body’s own powerful healing abilities through a stimulation of the Central Nervous System. The cranio sacral wave is, simplified, a 3rd body pulse, aside of the heartbeat and breathing. Ideally the cranio sacral wave flows freely and uninhibited with app. 40 microns of measurable energy, in a specific sequence, transported through the cerebro spinal fluid, from the cranium to the sacrum: the Cranio-Sacral system. Restrictions within body tissue caused by regular “wear and tear”, advanced age, trauma, injury, stress, tension etc. lead potentially to an inhibited or altered flow of body own energy thus impairing or distorting the balanced function of the central nervous system, causing potentially a variety of imbalances or disorders throughout the equine body. CST clearly points out the difference between posture and conformation! A horse with good conformation and bad posture can potentially look and perform equally poor as a horse with truly bad conformation. CST can help to improve posture and restore an equine body’s natural conformation and biomechanics. Cranio Sacral Therapy (CST) has been successful in the treatment of neurological disorders like head shaking. Weaving and cribbing have also been addressed successfully. CST is often routinely applied to TMJ problems (Temporo-Mandibular Joint Syndrome), an issue found in many performance horses as a result of bitting. TMJ is often also occurring as a “by-product” of regular dental work. Symptoms can be limited flexibility in jaw and poll, limited motion range upon chewing , compression (“white-eyed” look) in a horse’s facial expression etc. Structural imbalances like shortened strides, pelvic imbalances, “hunter bumps”, certain back problems etc. and the soft tissue problems that typically go along with those disorders are further examples potentially benefiting from Cranio Sacral Therapy. The structural alignment of the skeleton and deep tissue relaxation through CST often aids in eliminating difficult, consistently re-appearing problems and can help with the achievement of optimized well being and performance! The benefits of Cranio Sacral Therapy are frequently demonstrated by our equine friends in powerful ways that appear to be beyond explanation yet explain itself through the restoration of the body’s natural balance. Cranio-Sacral Therapy is a safe and potentially highly effective modality, leading ideally to an equine partner with a structurally balanced body and a sound mind! All horses at Windermere Farms, including our sale horses, benefit from regular Cranio-Sacral sessions!